Trumpeter Swan: this endangered bird breeds at Malheur National Wildlife Refuge. A pair of juveniles wintered in northeastern Jackson County in 2009. Tundra Swan: winters near Portland and in Klamath NWR. Redhead: breeds in south central Oregon, esp. at Malheur. A few may be breeding at Klamath Lake. Harlequin: uncommon breeder in some Cascade streams. Barrow's Goldeneye: both breeds and winters east of the Cascades; can be found wintering in small numbers in Rogue Valley, e.g. below Gold-Ray Dam on Rogue River. Scoter species: all three found along the coast in winter with Black Scoter being rare; White-winged regular in estuaries such as Coquille River mouth at Bandon. Long-tailed Duck: scarce but regular wintering duck along the coast, may join scoter flocks. Mountain Quail: easy to hear in spring, much harder to actually see. Resident in mountain forests where there's been a fire or clear-cut, may approach coast in winter. Can be heard on Mount Ashland and along Dead Indian Road above 3000 feet. Red-necked Grebe: Breeds on Upper Klamath Lakes; also uncommon coastal migrant. Clark's Grebe: Breeds in south central Oregon, esp. at Klamath Lake. Sooty Shearwater: present along coast from May to October. Leach's Storm-petrel: breeds on offshore rocks on southern Oregon coast in Curry County. American White Pelican: breeds in eastern Oregon lakes, can be found on Howard Prairie Lake near Ashland. And is abundant in warm months on Klamath Lake. Brandt's and Pelagic Cormorant: coastal breeders in Oregon. Least Bittern: secretive breeder in south central Oregon. Northern Goshawk: breeds in high mountain coniferous forests, esp. Cascade region including Crater Lake. 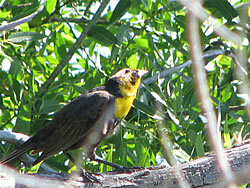 Also breeds in northeastern Oregon; can be seen soaring over mountaintops and wooded valleys; viewed from above there are white tufts at the base of the hawk's tail. Swainson's Hawk: breeds in drylands of eastern Oregon including Malheur area and dry pastures of Klamath Basin, esp. along Township Road south of Klamath Falls. Ferruginous Hawk: year-round resident in southeastern Oregon including Klamath Lakes region. Rough-legged Hawk: migrant from the north, especially plentiful in Klamath Basin during winter. Merlin: a scarce but annual wintering bird in Rogue Valley. Yellow Rail: has a tiny breeding range in the Klamath region. Black Oystercatcher: breeds along rocky sections of Oregon coast. Upland Sandpiper: rare breeder in small area of eastern Oregon. Black Turnstone and Surfbird: often seen in mixed flocks in winter and late fall along rocky sections of Oregon Coast, definitely not dune birdies. Wilson's Snipe: can be found breeding in Howard Prairie and at Willow-Witt Ranch in Cascades. Winters in watery marshes along Bear Creek and Rogue River. Wilson's Phalarope: regular migrant through eastern Oregon, esp. Klamath Lakes, Malheur and also irregular breeder. Heermann's Gull: coastal wintering bird. Thayer's Gull: most common along the central and northern coast of Oregon in winter. Western Gull: common year-round on coast. Glaucous-winged Gull: wintering gull on coast and northern Willamette valley. Black Tern: breeds in wetland areas of central and southern Oregon east of the Cascades. May also breed some years in Willamette Valley. Alcids: numerous alcids breed or feed along the Oregon Coast. Pigeon Guillemot nest on mainland cliffs; Marbled Murrlet in old growth forests; Cassin's Auklets, Ancient Murrlet and Horned Puffin all breed along coast in limited numbers. Band-tailed Pigeon: in woodlands of western Oregon. Common in Siskiyous uphill from Ashland. Has become a daily visitor to my feeders in Ashland. Eurasian Collared-dove: becoming established in the Rogue Valley. Owls: thirteen species are regular breeders in the state, with the Great Gray Owl being the biggest owl native to Oregon. The Boreal Owl has a tiny range in the Cascades and a few spots in northeastern Oregon. Some winters a few Snowy Owls enter Oregon. Black Swift: only two breeding colonies known in Oregon. Can be seen at Salt Creek Falls in Lane County, about 4,000 feet elevation. Chapman School, Portland; First Presbyterian Church, Corvallis; Agate Hall, Eugene. Anna's Hummingbird: common year-round in the Rogue Valley. The only hummer that regularly winters in large numbers in Oregon. Calliope Hummingbird: breeds in Blue, Steen, Wallowa and Hart Mountains in eastern Oregon. Uncommon but regular in Siskiyous, often found along Tolman Creek Road above Ashland in spring. Rufous and Allen's Hummingbirds: Rufous found over western third of Oregon, Allen's only in the extreme southwestern corner of the state. Not distinguishable in the wild by sight alone. The Allen's metallic shriek is different from the various sounds of the Rufous. Both species can return to breeding territories in February. Allen's display flight is a rocking chair motion while the Rufous is J-shaped. Lewis's Woodpecker: regular wintering bird in Rogue Valley, can be seen at Agate Lake east of Medford and in the oak woods uphill from Emigrant Lake near Ashland. Scattered areas of breeding east of Mount Hood in oak/ponderosa forests. Highly gregarious. Black-backed Woodpecker: can be seen along the Williamson River north of Klamath Lake. Not expected west of Cascades’ summit. Williamson's Sapsucker: forest on eastern slope of Cascades. It was here the very first specimen was collected 160 years ago by an American railroad survey team. Red-naped Sapsucker: mountain forests of eastern Oregon. Red-breasted Sapsucker: forest bird of Cascades and coastal ranges, breeds in upland forests around Ashland, over-winters in the area. White-headed Woodpecker: mostly found in the Cascades, but also on Mount Ashland in the Siskiyous and in the forests around North Klamath Lake. Favors open ponderosa forests. Northern Shrike: scattered but regular wintering bird in mid-level elevations of Cascades and other cold, windy spots. Have seen this bird in January along Dead Indian Road and near Howard Prairie Lake. Olive-sided Flycatcher: found in tall trees of Oregon's evergreen forests. Often located by its distinctive three-note call from a treetop. Declining in numbers due to loss of wintering habitat in tropics. Hammond's & Dusky Flycatchers: mountain forests of western Oregon, difficult to tell apart. Dusky prefers more open habitat and the edges of clearings. Dusky has longer beak and tail. Pacific-slope Flycatcher: breeds in appropriate riparian habitat in western Oregon; overlaps with similar Cordilleran Flycatcher in far northeastern Oregon. Black Phoebe: found only in the extreme southwestern corner of the state. Present in Rogue Valley around Ashland. Ash-throated Flycatcher: prefers oak or juniper woodlands with lots of sunshine and open ground. Found near Emigrant Lake's south end, not far from Ashland. Also breeds in the woods of Jacksonville Cemetery. Cassin's Vireo: widely distributed across the state except in southeastern corner. Nests in upland forest, e.g. near wildlife viewing pull-out along Hyatt Lake. Hutton's Vireo: partial to moist woodlands along Oregon's coast. Can be found in Rogue Valley and mid-elevation slopes of the Siskiyous, e.g. upper Tolman Creek Road, Ashland. Gray Jay: partial to mountain campgrounds and parks. Sparse on Mount Ashland. Steller's Jay: present in my garden everyday. Vocal and insistent when it's time for peanuts. Pinyon Jay: Gregarious resident in very center of Oregon, east of Cascades. Clark's Nutcracker: found only in the highest mountains, especially along the cascade Range. The most readily found bird around Crater Lake's visitors' center. Violet-green Swallow: found all over the state, especially in the moister forests of western Oregon. Mountain Chickadee: the name says it all. The white eyebrow is the field mark you watch for. Larger than Black-capped or diminutive Chestnut-backed which are found at lower elevations. Pygmy Nuthatch: found in some dry forests on west side of Klamath Lake, e.g. Eagle Ridge Road. American Dipper: nesting in many mountain streams of Rogue Valley. That includes downtown Ashland along Ashland Creek in Lithia Park across the street from my home. Also nesting near Little Hyatt Lake north of Highway 66, Jackson County. Mountain Bluebird: regular from Cascades eastward. Small population near peak of Mount Ashland. Townsend's Solitaire: bird of high elevation forests. Can be secretive. Varied Thrush: secretive nester in damp forests of western Oregon. Some winters it can be abundant. Black-throated Gray Warbler: Bird of mixed forests, some riparian but not marshy. Thus population can be spotty and unpredictable. Present on western slopes of Rogue River valley, near Jacksonville and Williams. Townsend's Warbler: Breeds in Cascade Range, evergreen forests. Bird of passage in Ashland area. Hermit Warbler: High-nesting denizen of fir forests in moist western Oregon. Often hard to find because it stays high in canopy. Birding from steep roadsides where you can look DOWN on forest is very helpful. MacGillivray's Warbler: Despite distinct and bold coloring this skulker can be hard to track through underbrush and damp scrub. Thrives in areas where tall trees have been felled. Green-tailed Towhee: Thrives in dry brushland with diverse plants. Can be found above 6,000-feet elevation. Does not winter in Oregon. Spotted Towhee: abundant resident of any brushy spot, like my garden. His drab cousin, the California Towhee, is found only in riparian habitat in this southwestern corner of Oregon. Golden-crowned Sparrow: common wintering bird in Rogue River Valley. Lincoln's Sparrow: found in Rogue Valley fall and winter, then in mountain meadows for breeding. Vesper Sparrow: Found in meadows of Willow-Witt Ranch and Howard Prairie in summer. This is the furthest west this bird regularly breeds. Black-headed Grosbeak: a common bird wherever deciduous trees are found. May also inhabit evergreens near water. Common at my feeder all spring and summer in Ashland. Cassin's Finch: Most common in Cascades and further east. Can be found in Siskiyous above the Rogue Valley. Does winter at selected garden feeders in Ashland area. Lesser Goldfinch: Common year-round here in the Rogue Valley. Abundant on thistle feeders all winter long, even when larger and less hardy. American Goldfinches: have all fled southward. Gregarious. Evening Grosbeak: unpredictable nomadic species, often seen around Ashland in May. Probably regular breeder in higher forests of Cascades, e.g. Crater Lake area. See also our extensive Oregon Bird Gallery!